Even though earnings results at CVR Refining and CVR Partners weren't great, shares of CVR Energy held up last month. 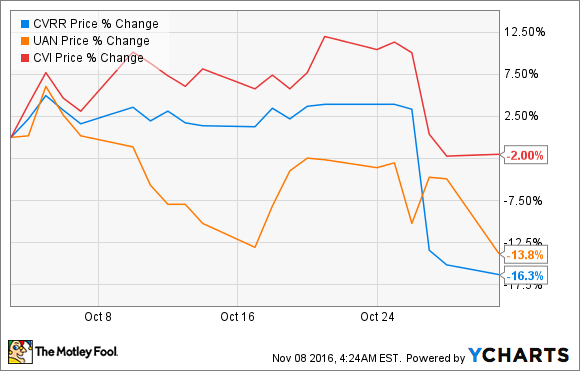 Shares of both CVR Refining (NYSE:CVRR) and CVR Partners (NYSE:UAN) fell more than 10% in October, after the two companies announced results that didn't measure up to analyst expectations for the third quarter. What is surprising, though, is that parent company CVR Energy (NYSE:CVI) didn't suffer nearly as much, even though its entire business depends on these two subsidiaries. Starting with CVR Refining, the company's third-quarter normalized net income result of $0.22 per share was well below consensus analyst expectations (compiled by S&P Global Market Intelligence) that pegged normalized earnings at $0.30 per share. A large reason for that decline had to do with the company's unplanned outages related to a power outage at its Wynnewood refinery, and a downtime at a third party's refined-petroleum-product pipeline that restricted total sales from its Coffeyville refinery. There was also the issue of higher-than-expected costs to comply with the U.S. EPA's Renewable Fuels Standard. It also didn't help that the company expects compliance costs to remain high, sapping profits in the coming quarters. While CVR Partners didn't have to deal with similar compliance costs, it has its own pressing issues of very low nitrogen-fertilizer prices and higher costs associated with the onboarding of its Rentech Nitrogen Partners acquisition. This led the company to post a normalized net loss of $0.12 per share, while analyst estimates from S&P Global Market Intelligence were expecting a $0.02-per-share positive net income result. The market reaction to these two things isn't that surprising. What is surprising, though, is that shares of CVR Energy weren't similarly punished. Even though the company reports its results as consolidated results from the two subsidiaries, the parent organization's cash flow comes from its ownership stake in CVR Refining and CVR Partners and the distributions to which it is entitled from that stake. Since both subsidiaries have suspended distributions, there is no cash coming in the door for CVR Energy to pay its dividends or any interest obligations. Despite this risk, shares of CVR Energy weren't nearly as adversely impacted. CVR Energy using cash on hand to cover any financial obligations and pay dividends isn't a sustainable track. Unless we see a rapid turnaround in the results at CVR Partners and/or CVR Refining, then CVR Energy will likely have to similarly cut or suspend its dividend. The one thing that can give some hope to investors is that CVR Refining is very good at running efficient operations and keeping costs low. So if we see a modest pickup in refining margins, the refining arm of this business should return to profits rather quickly. Also, there are some promising signs that nitrogen-fertilizer prices are starting to rise. If these two things were to happen, then both should be able to restore some kind of distribution to help CVR Energy cover its cash outlays. Until we actually see these things happen, though, don't expect much from any of these stocks.